Swedish artist Love Hultén triumphantly returns to our PC Case Mod of the Week feature with his latest creation, 4M, a computer that answers the question "Does this HAL 9000 unit come in walnut?" How much more menacing is 2001's mechanical menace with his signature glowing red eye encased in natural walnut? Would his dying rendition of "Daisy Bell" be more poignant if his materials were once in close proximity to an actual daisy? One thing is for sure, Love has a flower within his heart, twisting about the mechanical muscle he regularly pours into stunning creations like these. 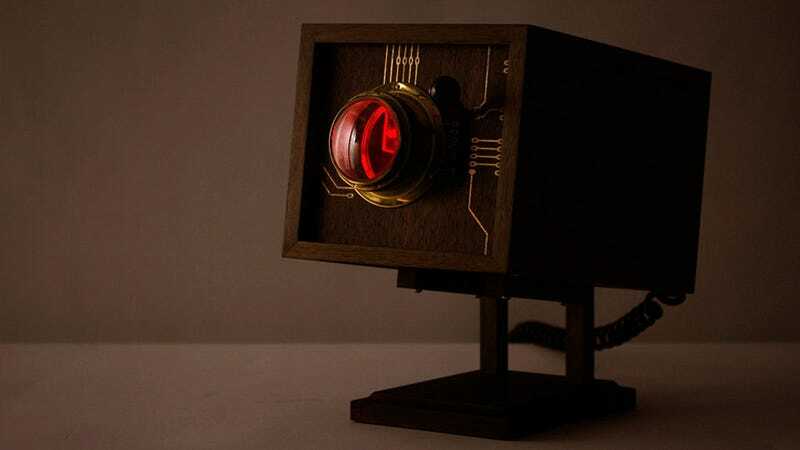 Featuring a DIY-joystick knob on the front alongside a brass window with a magnifying glass lens providing an excellent view of the system's glowing red interior, the 4M is accompanied by a custom-made wooden monitor with a swiveling face and toggle-switch. The 4M, like the Sputnik0667, is a vision of what our electronics might look like if plastic never came into power. Will I enjoy translucent cases festooned with glowing LEDs as much as the next PC gamer, there's something to say about simple, natural elegance.